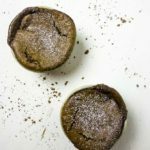 Light and fluffy, rich and decadent, this easy Chocolate Souffle Recipe is the perfect special occasion dessert. Preheat the oven to 400 degrees and place the chocolate pieces in a medium to large sized bowl. Add milk and cornstarch in a saucepan and whisk over medium heat until brought to a simmer. Cook, stirring constantly, until thick, about 1 minute. Pour over chocolate pieces and stir until chocolate is fully melted. Combine the egg yolks, whipping cream and vanilla extract in a bowl and whisk. Slowly mix the egg yolk mixture into the chocolate mixture and set aside. Using a hand or a stand mixer, beat the egg whites in a separate bowl until they become frothy. Add the cream of tartar. Add the sugar, a little at a time while beating, until stiff glossy peaks form. This should take about 5-7 minutes. Gently fold in the egg whites, being sure not to over mix. The batter should be light and fluffy and still full of the air bubbles from the egg whites. Fill each ramekin halfway full with the batter. Add a piece of the milk chocolate in the center of each (this step is optional but I love it). Top them off with the remaining batter. Place the ramekins on a baking sheet on the bottom rack and bake for 10-12 minutes, or until the souffle rises and a toothpick comes out clean. Rotate the baking sheet halfway through to account for any uneven oven temperatures. Dust with a little powdered sugar and serve immediately. Use the best, richest chocolate you can find for the best results. Always use dark, unsweetened (baking) chocolate. I never recommend cocoa powder. To enable the egg whites to whip properly, use room temperature whites. The cream of tartar also help the egg whites get the right consistency. Be careful not to overmix the batter when folding in the egg whites. The batter shold be fully mixed, but should have a light and airy texture. Over mixing will impact how well the souffles rise. For a super clean look, run a knife edge across the top of the ramekin to smooth the batter. Always bake a souffle on the bottom rack for the best results. To test for doneness, stick a toothpick in the center of the souffle. If it comes out clean, souffle is done. If not, bake another 2-3 minutes and test again. Souffles should have risen about 1-3" above the edge of the ramekin when done. Note if egg whites were not beaten enough, cold egg whites were used, or batter was overmixed the souffle may not rise as high as expected. Souffles are meant to serve immediately. They will start to fall after about 5 minutes.